In contrast to baseball games now, in which players have to spit several times and adjust their crotches and cross themselves before they do anything, the game on September 9, 1965 was played at a brisk pace. It was over in less than two hours, and when it ended, history had been made. 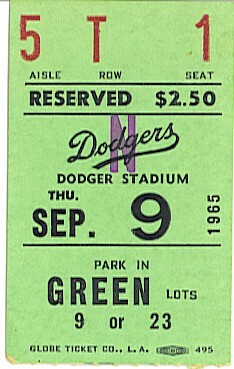 Sandy Koufax of the Los Angeles Dodgers pitched a perfect game that night, and I was one of 29,000 fans in attendance. For some, I suppose a perfect game would be Free Beer Night, but in baseball jargon, a perfect game means that the pitcher did not allow any opposition player to reach base by any means — no hits, no walks, no errors. In other words, no action. What was even more boring — for a while — about this game was that Bob Hendley of the Cubs was pretty much doing the same thing to the Dodgers. A journeyman who was with his second team of the ’65 season, Hendley had yielded a base on balls to Dodgers outfielder “Sweet” Lou Johnson in the 5th inning; Johnson advanced to second base on a sacrifice bunt by Ron Fairly. He then attempted to steal third base, and Cubs catcher Chris Krug threw the ball into left field, allowing Johnson to get up and run home. The Dodgers had scored without a hit — in fact, without an official at-bat. That was pretty much the only action in the game to that point; those of us in the stands were reading the advertisements in the program just for something to do. Along about the 7th inning, though, it began to occur to us that we were seeing something almost unprecedented: both pitchers were throwing no-hitters! With two out in the 7th, Lou Johnson broke up Hendley’s no-hitter with a bloop double just over the head of Cubs first baseman Ernie Banks, but Johnson was left stranded. This proved to be the only hit in the game, and it had nothing to do with the scoring. By now we were definitely not bored; from the 8th inning on, the crowd roared on every strike, and booed the umpire if he called one of Koufax’s pitches a ball. Vin Scully’s voice wafted over the stadium, his call of the game being broadcast over thousands of transistor radios in the stands. As Bob Hendley walked off the mound at the end of the 8th, he got a standing ovation from almost everyone in Dodger Stadium. We wanted Koufax to prevail, of course, but we realized that Hendley had turned in an exceptional performance, even though it was in what we hoped would be a losing cause. The last batter of the game was pinch-hitter Harvey Kuenn, batting for Hendley. Kuenn was a lifetime .300 hitter, but he struck out on a 2-2 count; Koufax had completed a perfect game. As you might imagine, at that point all 29,000 of us did not quietly file out to the parking lot. Exultant fists were thrust into the air, seat cushions were flung onto the field, thousands of throats sustained significant damage to their vocal cords. People jumped and hugged and proposed marriage to total strangers. Koufax came out of the dugout and doffed his cap to the crowd; somehow the din grew even louder. It was the best pitching performance by the best pitcher I ever saw: Sandy Koufax struck out 14 batters that night, including the last six. It was the best pitching performance of Bob Hendley’s career as well; his earned-run average for that season was just under 6.00. What had been a boring game for the first hour or so turned into one of the most memorable in L.A. Dodgers history, right up there with Kirk Gibson’s home run in the 1988 World Series. I was present for that one, too; remind me to tell you about it sometime. This entry was posted in Sports and tagged baseball, Sandy Koufax. Bookmark the permalink. I’m not sure it was this particular game about which Drysdale said that, but he had a good point. The Dodger pitchers led the league in Earned Run Average, with an amazing team average of 2.81, but were toward the bottom of the league in batting average, at .245. The entire team had only 78 home runs all season, and Drysdale — a pitcher — had seven of them! Cool story! I like your alternate idea of “Perfect Game” and plan to start a letter-writing campaign.